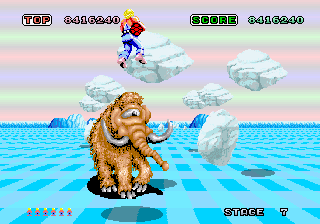 Space Harrier must go down as one of the most classic arcade games of the 1980's, perhaps even of all time. Released by those gaming giants SEGA in 1985 and produced by the legendary Yu Suzuki this game combined 3rd person pseudo 3D action with stunning and imaginative graphics, superb in-game music and nicely implemented digitised speech. 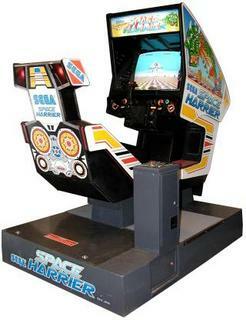 It was also one of the first arcade games to feature 16-bit graphics and SEGA's own Super Scaler technology (the technology for 3 Dimensional sprite scaling at fast speeds), which allowed for the games detailed and colourful graphics to move around the screen at a fair old clip. If you played the full tilt hydraulic cabinet version with speakers either side of your head then you really were immersed into the truly fantastic, and truly imaginative, Fantasy Zone. 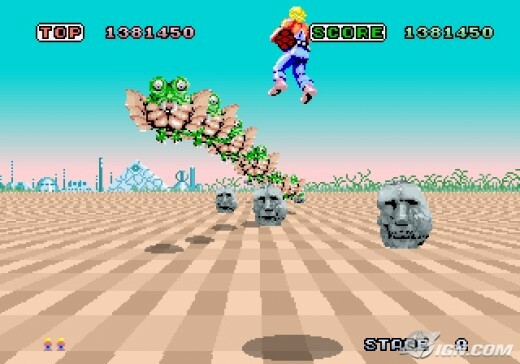 Space Harrier was a 'rail shooter' viewed from the 3rd person '3D' perspective. With it's advanced (for the time) SEGA graphics technology the pseudo 3D sprites moved smoothly and rapidly as you (the mighty 'Space Harrier') plowed your way through the fantasy zone killing pretty much everything in site and avoiding indestructible pieces of the landscape. 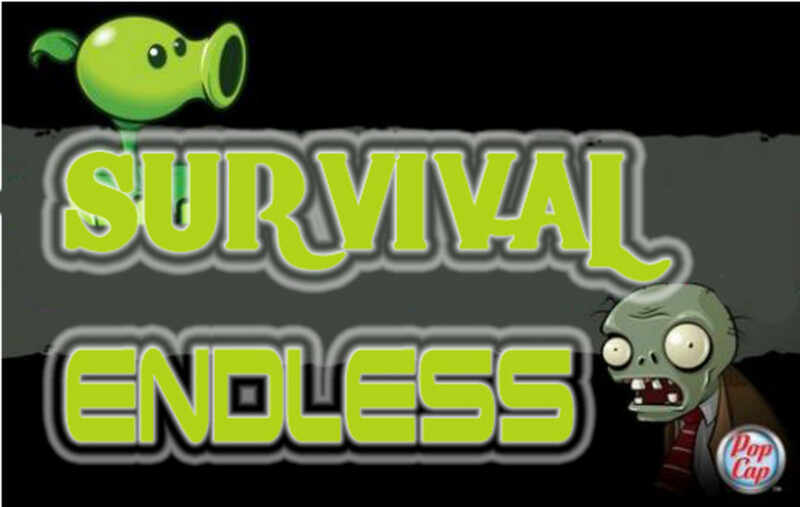 Enemies and obstacles would come hurtling forwards towards you, most of which could be blasted out of the way, save for some indestructible objects. For instance, granite like rocks would be littered across the ground or could be floating in mid air, and you would either have to shoot them out of the way or weave your way around them if they were indeed 'bullet proof'. Some of your adversaries would shoot projectiles at you which you had to avoid, ranging from egg shaped energy bolts to faster moving fireballs. Collision with any would result in the loss of a life and the all too familiar "AAaaahhhh!" sound as your Harrier dropped to the ground. Bigger enemies such as flying dragons, which on first encounter were distracting as they weaved beautifully through the air were out to get you. Huge floating stone heads would appear and move towards you and would require multiple hits from your gun before being destroyed. At the end of each level there would be a boss alien to duel with, and it could take a while to wear them down and dispatch them. Some levels would pit you against more than one enemy at this stage; you had to destroy them all to advance to the next world. These end of level enemies were beautifully designed ranging from two headed dragons to massive 'Easter Island' type floating stone heads. After defeating a boss or bosses the player was treated to more superb digitised speech as the machine announced "You're doing great!" 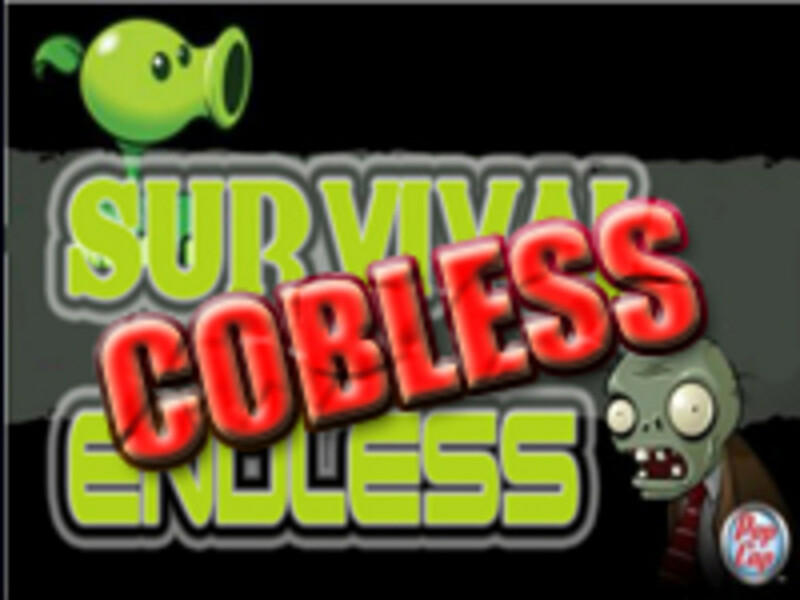 The game was very simple in concept, but the playabilty for blasting fans was almost perfection. SEGA's classic really is an example of how to execute a simple fast moving rail shooter properly. All of this was balanced perfectly against the excellently drawn and imaginative graphics, the pumping in-game music, the excellent sounds effects and perhaps most of all, the true analogue joystick for controlling your character. This type of game controller allowed the player the ability to register movement in any direction as well measure the degree of 'push' applied, which could move the Harrier at different speeds depending on how far the stick was pushed in any given direction. Combine this with the full tilt hydraulic sit down cabinet and SEGA gave us a gaming experience like no other before. The game stood out from other machines in the arcade as soon as you laid eyes on the huge full tilt cabinet, It was usually surrounded with a crowd of people around it, all waiting for their turn as someone lurched and dipped on the hydraulics, dodging and blasting their way through the Fantasy Zone. But not only did this game stand out simply because of it's 'first glance' appearance, once you played it the way the game looked and sounded hooked you in instantly. Who can forget the little noise the machine made when you put your coin(s) in? Who can forget the cry of "Welcome to the Fantasy Zone... Get Ready!" as the in-game music kicked in? The graphics were not only impressive due to their 3D appearance and speed, they were also impressive due to their slight 'weirdness'. The levels were excellent in design and the whole look and feel of the game was pretty unique back in 1985. Later levels produced even more strange creatures such as one eyed wooly mammoths, giant robots, huge jet fighter planes, colourful crystals, giant mushrooms, alien skeletons and large bulbous squids. Sometimes a 'roof' would appear mirroring the ground making manouvering the level that little bit more difficult which was again a nice touch from the developers. It was these bizarre enemies and scenery that made the game stand apart from many other titles of the era. The sound effects that accompanied the game were also brilliant and matched up with the slightly off the wall graphics pefectly. All in all the visuals and audio were top notch - and I bet many of you still find yourself humming the classic in-game music from time to time! Gameplay was spread over a number of stages (eighteen in total which were all strangely named such as Moot and Geeza in keeping with the atmosphere of the game) along with some 'bonus' stages to play through. If you made it to a bonus stage then you would get to site astride a friendly floating chinese style dragon and plow your way through the landscape (no shooting on the bonus levels) to earn an extra load of bonus points. At the end of the bonus stage your harrier would hop off the dragon which would fly off into the distance and disappear. It would be back to normal action again in the next level but these bonus stages added an extra dimention to the gameplay and a welcome break from the fast paced action. The eighteen levels were quite a challenge with the later levels being pretty difficult and fast moving. If you had reflexes bordering on precognition and sublime arcade skills (or just a truckload of coins to play with) then you would perhaps make it to the end of the game. The machine would then matter-of-factly informed you that it was indeed 'The End'. But don't worry, as 'many more battle scenes will soon be available'. 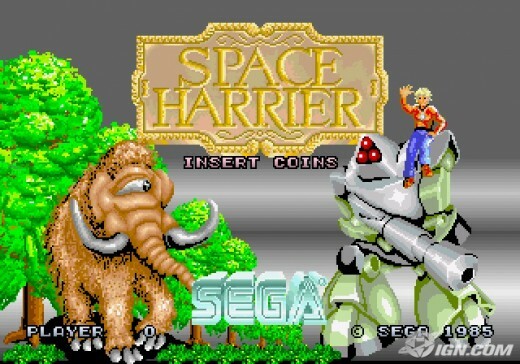 Want To See The End Of Space Harrier? 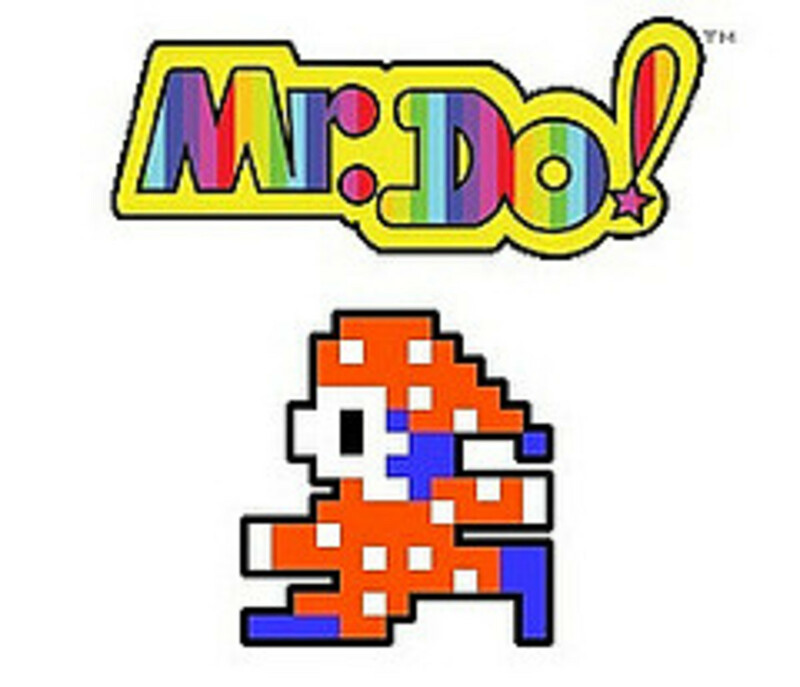 This game ended up being more popular than loose change in an amusement arcade and it was only a matter of time before conversions to home computers would be developed. Machines such as the C64, Amstrad CPC 464, ZX Spectrum, Atari ST and Commodore Amiga were treated to their own renditions of 'Fantasy Zone'. As expected the 8-bit machines were hopelessly outmatched by the arcade hardware of the day. It should be noted that the Amstrad CPC version used three dimensional wire-frame graphics to keep the game moving a decent pace, which did go against the novelty of the arcade original. Still, the ZX Spectrum and the C64 version of Space Harrier played reasonably well, and the Speccy version is a testament to programmer Keith Burkhill (one of the finest spectrum games programmers in my opinion) as he managed to squeeze so much into so little. The 16-bit versions were actually not as good as they should (and could) have been. In my opinion the SEGA's own master system version paled when compared to the arcade hardware, and fans of Amiga games were treated to an average conversion at best. It has to be said though that capturing the spirit of the SEGA original was always going to be a nigh-on impossible task; for me even the Xbox and Playstation versions of more recent times cannot fully re-create the magic that we all first saw back in 1985. 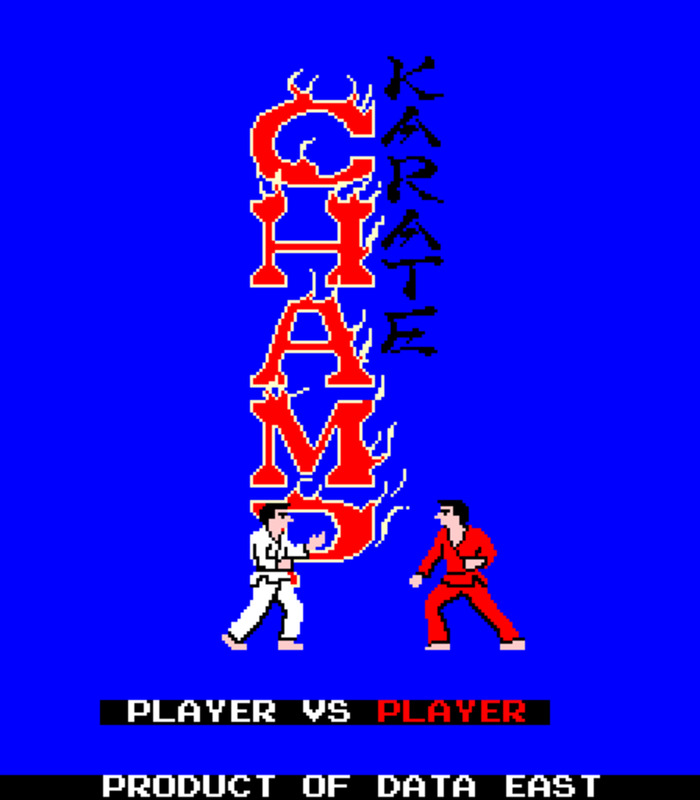 This arcade game for me is a true classic (and one of the best) of the 1980s. Everything about it is near perfection; the gameplay, the graphics, the music, the sound effects, the controller and the hydraulics combine seamlessly to give us a pure 100% thrill ride that is still fun to this day. If you are too young or never managed to play this one back in the day I really cannot stress just how good and revolutionary it was back then. If you happen to find one in a dingy dark corner of an arcade then please give it a go - you will not be disappointed. Any Other Fantasy Zone Visitors? That game looks very interesting! 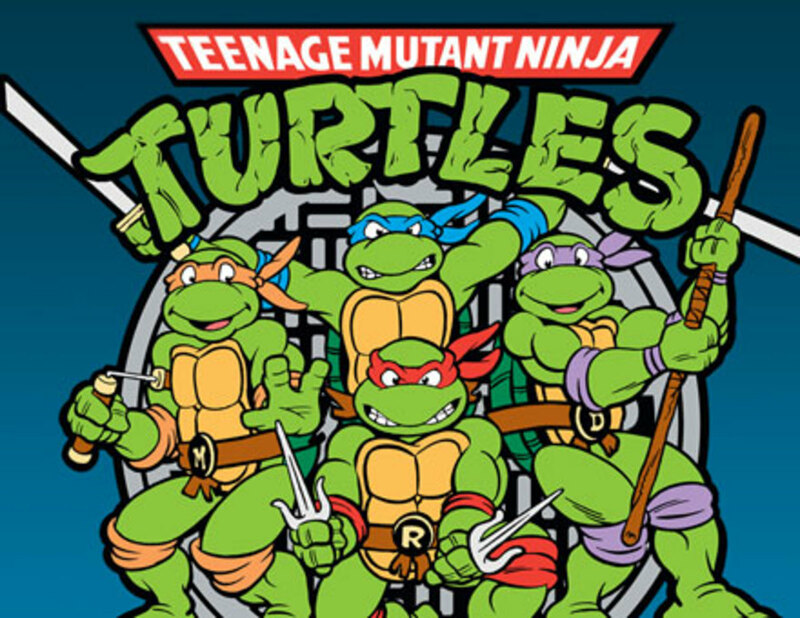 I used to love playing this game at my local pizza place when I was a kid. What a great game. Yu Suzuki is a genius.